NOTE: Realtime processes are deprecated. Please use the Kafka Indexing Service for stream pull use cases instead. For Apache Druid (incubating) Real-time Process Configuration, see Realtime Configuration. For Real-time Ingestion, see Realtime Ingestion. Realtime processes provide a realtime index. Data indexed via these processes is immediately available for querying. Realtime processes will periodically build segments representing the data they’ve collected over some span of time and transfer these segments off to Historical processes. 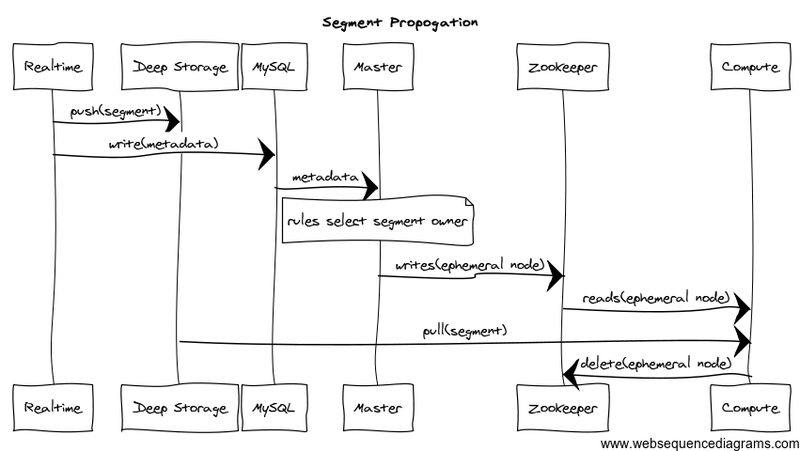 They use ZooKeeper to monitor the transfer and the metadata storage to store metadata about the transferred segment. Once transfered, segments are forgotten by the Realtime processes. You can read about the various components shown in this diagram under the Architecture section (see the menu on the right). Note that some of the names are now outdated. The expectations are that the former will be very common and something that users of Druid will do on a fairly regular basis. Most users will probably never have to deal with the latter form of customization. Indeed, we hope that all potential use cases can be packaged up as part of Druid proper without requiring proprietary customization. Given those expectations, adding a firehose is straightforward and completely encapsulated inside of the interface. Adding a plumber is more involved and requires understanding of how the system works to get right, it’s not impossible, but it’s not intended that individuals new to Druid will be able to do it immediately. The real-time process exposes several HTTP endpoints for interactions. Returns the Druid version, loaded extensions, memory used, total memory and other useful information about the process.